I grew up in quite a large family and was used to seeing my parents buy in bulk. As this is generally the most economical way to shop I never really considered doing anything else when I left home and was responsible for my own groceries. However, when there's just two of you, bulk buying just tends to end up with a lot of waste as bag after bag of 'buy one get one free' salad goes in the bin followed by half a block of mouldy cheddar and a punnet of mushy strawberries. Throwing out food is not only expensive, I also feel that it is immoral. Who's mum hasn't said to them "Finish your food - there are children starving in Africa"? whilst whether you finish your lasagne or not will make absolutely no difference to whether people go hungry on the other side of the world, we need to remember just how lucky we are in the affluent West and endeavour to waste as little food as possible. With this in mind I was determined not to throw out the mountain of food that seemed to have developed in my fridge and I set myself the mission to use the produce that I already had in the house - fridge, freezer & cupboards - when I drew up my weekly meal plan. And all I needed to buy to make the following recipes was 2 tubs of cream and a packet of tomatoes. At this point I probably need to mention the importance of a well stocked kitchen. I plan to do a future post on this subject, but for now I'll just say that a good stock of tinned chickpeas and tomatoes and an assortment of dried herbs and spices will take you a long way when you need to knock up a tasty meal without hitting the supermarket. 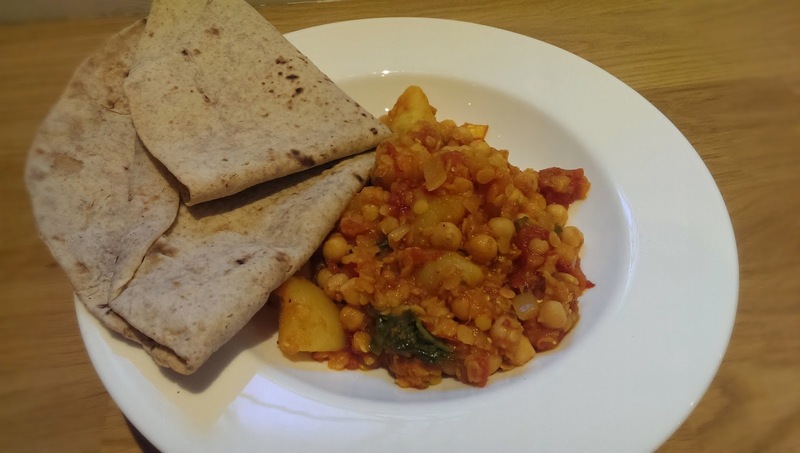 A spicy potato and chickpea dhansak helped me to use up some of the potatoes and the seriously wilted coriander which I pepped up by dunking in a bowl of iced water for 10 minutes. I then consulted with my guru, Nigella, who suggested this a-m-a-z-i-n-g strawberry & almond crumble for my squishy strawberries. To be honest this was so good that I would actually buy strawberries just to make this. 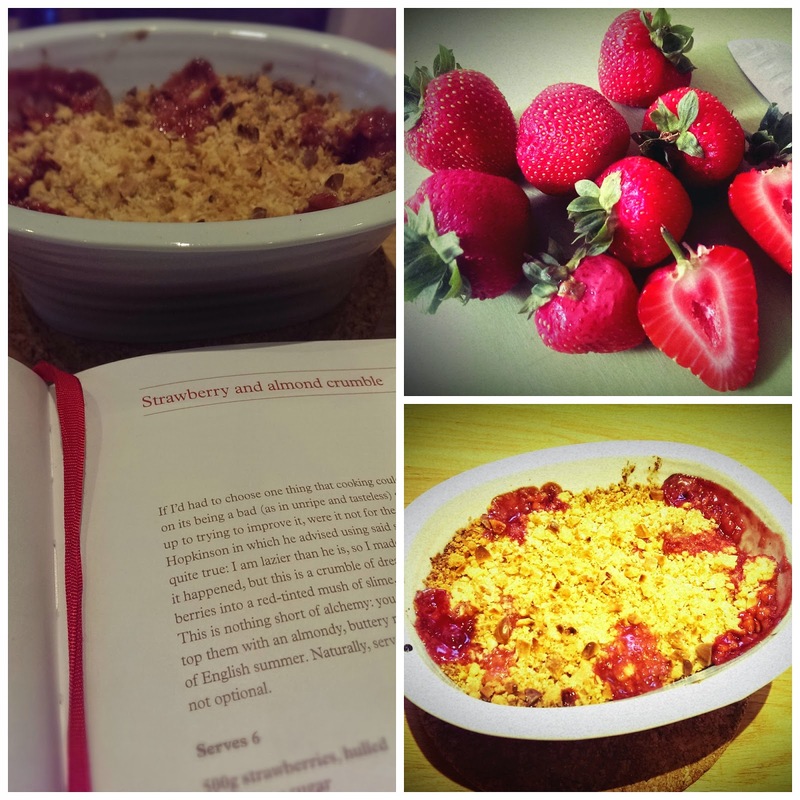 I only had about half the amount of strawberries needed for the recipe, but as I wasn't feeding 6 people I just halved the quantities of the rest of the ingredients and made a mini crumble! 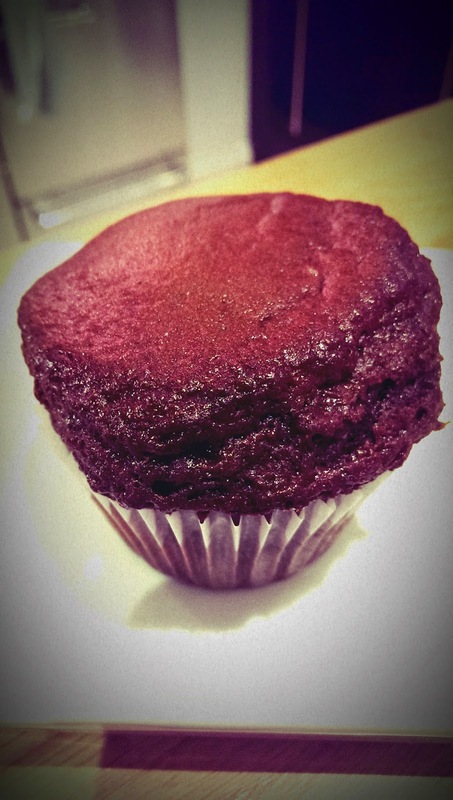 Another recipe that I halved was this one for caramel chocolate muffins. 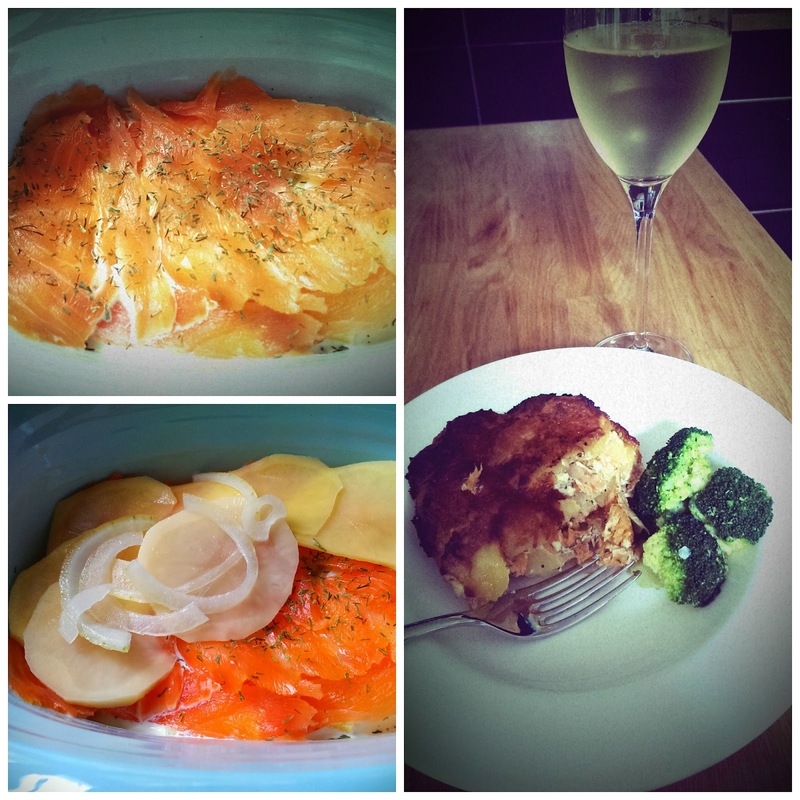 I dug out a packet of smoked salmon from my freezer to make this potato & smoked salmon dauphinoise. Again I altered the recipe - I don't like celeriac, so I just used more potatoes and onions, and I used dried dill rather than buy a packet of the fresh herb (I didn't want to have to find a recipe to use up the rest of it in a couple weeks time!). Dried dill is about the only herb which you can happily substitute for the fresh version, so it's a great cupboard staple. 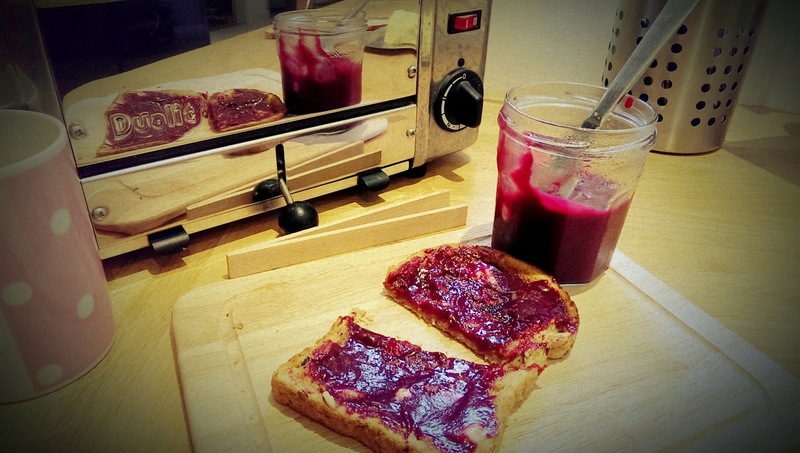 The highlight of my project was blackcurrant ice cream - absolutely delicious and I thought these jam jars made pretty cute (generous) individual servings. I used up the last of the blackcurrants, along with some blueberries I found on the depths of my freezer, in this tangy blueberry, blackcurrant & basil curd. My mission was successful - I managed to make tasty meals out of food which would otherwise have been thrown away. What dishes have you created from the random ingredients? Do you struggle to not buy too much food? That blackcurrant ice cream looks amazing! You would have a field day in my mums house. She always has bought in bulk and even though all the 'kids' have now left home, she still buys just the same amount! She could do with a visit from you to knock up some tasty meals! My mum's the same - I think my parents could survive a 6 month siege!! 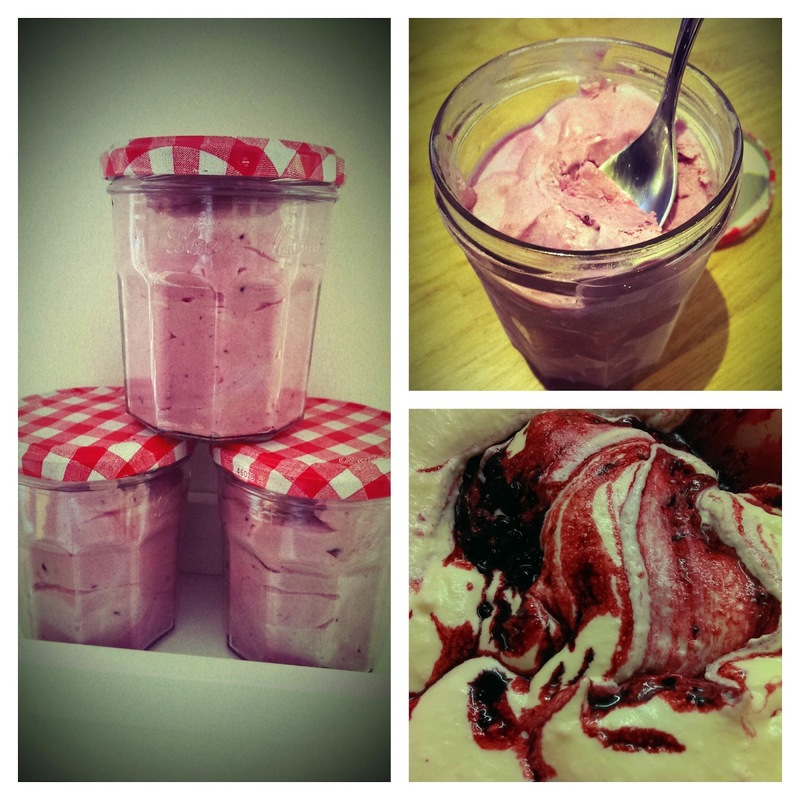 If you get your hands on some blackcurrants that ice-cream is well worth a go!